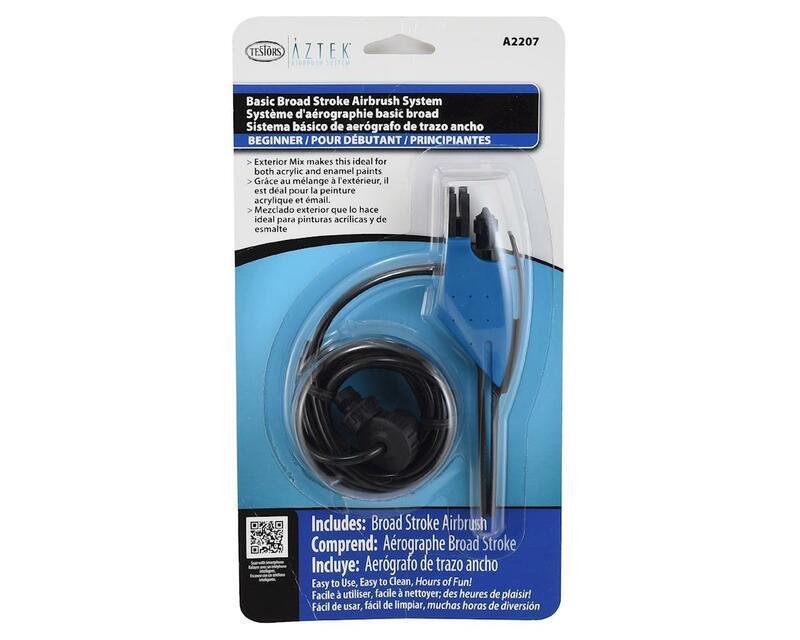 The Testors/Aztec Broad Coverage External Mix Airbrush is a single action, external mix type airbrush that is perfect for craft, modeling and educational applications where a broad coverage airbrush can be a useful tool. An external mix airbrush combines the air and the paint outside of the airbrush. As air passes over the paint tip, it sprays the paint toward your project. This mixing method produces a courser, grainier spray, making freehand spraying and detail work more of a challenge. However this is the easiest and least expensive design, making it a great choice for beginner airbrush users and children. Fill Aztek airbrush reservoir jar with one of hundreds of non-toxic acrylic or enamel colors. Unit is ready to spray. Color changes are quick and easy and require no messy clean-up. Education - Create custom colors and effects for exciting classroom projects. Modeling - Broad coverage provides an even coat when applying paint or primer to model kits. Craft - Easily creates a broad range of special effects and spray patterns by masking and stenciling. Large coverage projects requiring broad stroke coverage.